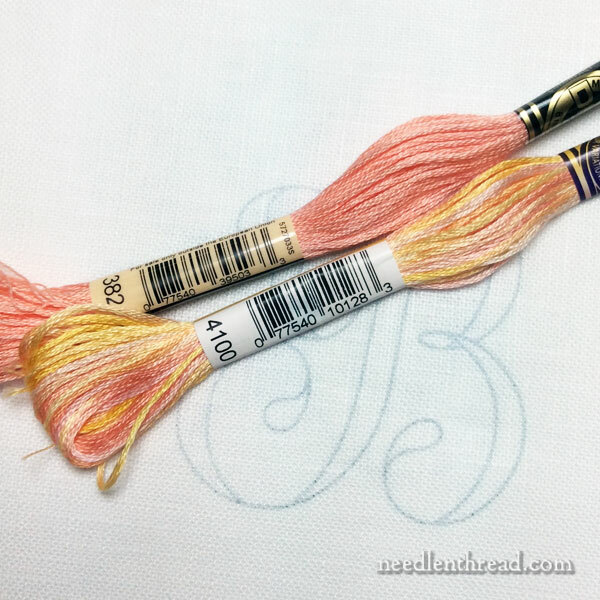 Just a quick little post this morning to show you a really simple, but pretty, approach to an embroidered monogram, using just two stitches and two skeins of floss. It’s so simple you can finish it in a day! And I don’t mean you have to stitch all day, either – tops, it’s about a three hour project. Here’s all the information, with links to tutorials that will help you whip up this pretty monogram in a short time, with few supplies! The two stitches involved in this letter are long & short stitch and stem stitch. Now, before you get all worried about the long & short stitch being too difficult or too complex, I promise you it isn’t! It’s such a forgiving stitch! You can make “mistakes” with it, and just sneak in a stitch or two here or there to cover them up, and no one will ever know. You can’t do that with most stitches! To work this monogram, I used two skeins of floss: DMC Variations in 4100 (it’s a yellow and pink combination with an “overdyed” look to it, with very subtle variations in the colors) and DMC 3824, which coordinates with 4100. I used Alba Maxima embroidery linen, a 4″ hoop (the letter is 2.5″ tall), and a #9 crewel needle for all the stitching. The long & short stitch is all worked with one strand of floss in the needle, and the stem stitch outline is worked with two strands of floss. 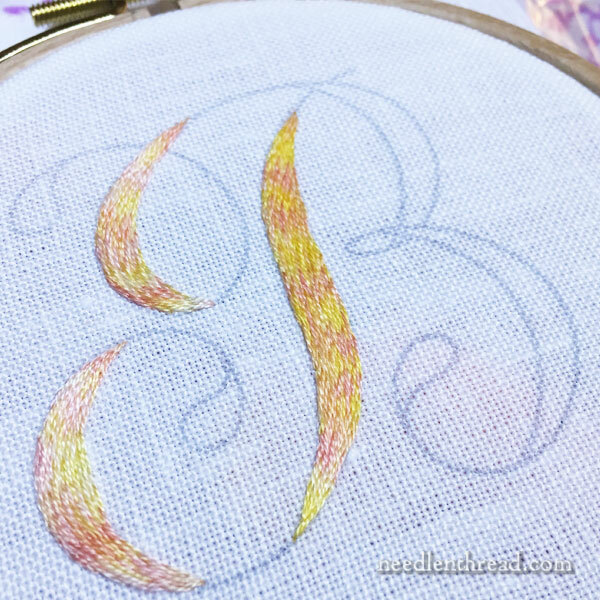 To work the long and short stitch as a filling for this particular monogram style (it’s the Shadow Work Script in Favorite Monograms), this tutorial on working long & short stitch on a ribbon shape will show you exactly how to handle filling in the letter. When working with Variations – again, the color changes are very subtle – you don’t have to be too precise in your color placement. Let the long & short stitch and the changes in color just mix as they will, and the filling will look fine! On other variegated flosses, where the color changes are more abrupt and less subtle, you might have to fiddle with color placement, but with Variations, you don’t have to concentrate too hard on where your changes are going to end up. They just sort of all blend in and out of each other, which I think works really well on a filled monogram. This particular color of Variation (4100) reminds me a pit of summery pink lemonade, but when it’s used for long & short stitch like this, it makes the letter almost look like shimmery gold, depending on the light it’s caught in. 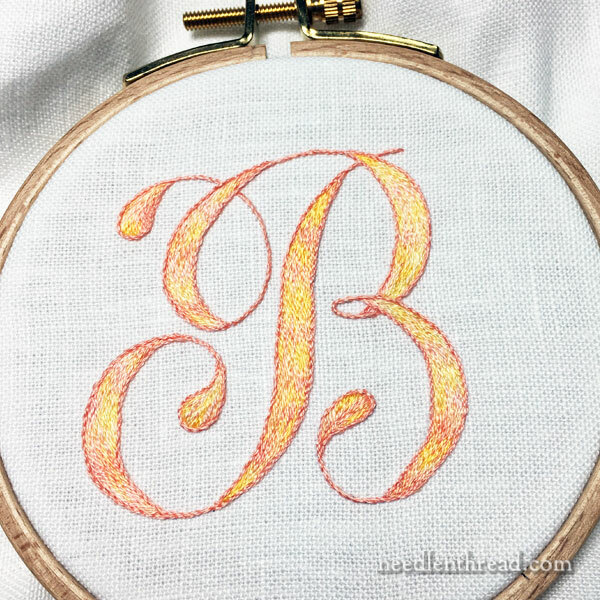 The stem stitch outline makes a nice finished edge along the long & short stitch filling, and it also serves to connect all the filled areas of the letter. More Monograms? More Stitching Tips? You’ll find the patterns for most of the stitched monogram tutorials in my e-book, Favorite Monograms. Don’t forget, this week we’re going to celebrate the new look of Needle ‘n Thread with a free kaleidoscope project! It’ll show up here on Needle ‘n Thread before the week is completely out. I’ll also be giving away an embroidery book or two over the next couple weeks, so you’ll definitely want to keep an eye out for those! And it’s October, which means I’m drumming up the courage to achieve this month’s Big Goal – sorting out my work room, organizing, re-arranging, and making it a more productive space. I’ll keep you apprised of my progress. Or of my non-progress, if I chicken out. Mary, thank you for yet another way to do a Monogram! Your imagination and creative ability make me a bit jealous, BUT I do so appreciate your habit of sharing your knowledge. You are such a wonderful asset. This is another lovely monogram and I love the variegated colour of yellow and pink beautiful and it sounds really easy to stitch that it only took a couple of hours to complete. It looks so soft and silky with a lovely shine to it. I do love your monograms you are always showing something different in style, thread colours etc I didn’t realise you could do so much combinations in a monogram. I can’t wait for up and coming posts and the progress you make on re-arranging your room, please photos. 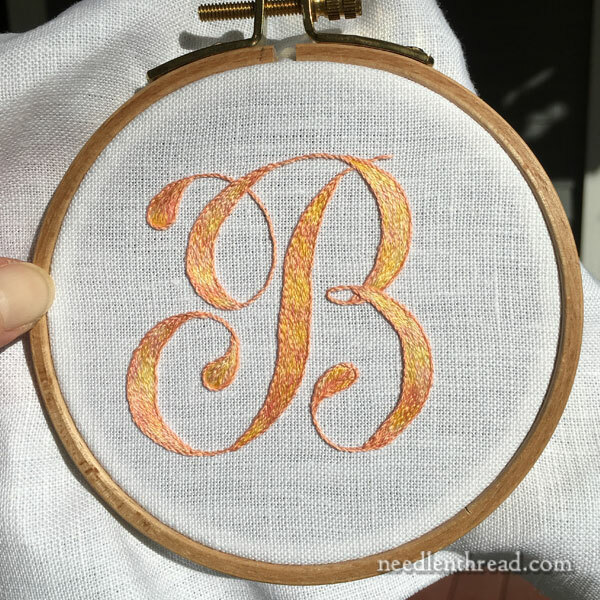 Thanks for sharing another beautiful monogram with us and for the tips and techniques on stitching the L&S stitch on curves. I have not seen the DMC Variations yet but wow! Now i’m going to be on the hunt for some. That pink and yellow blends to such a beautiful color. It does look like a shimmery gold. Love it. Oooh, I have to get some of that color variations floss! The combination of pink and yellow is lovely, and such a cute monogram. Beautiful, Mary! So just to clarify though…you filled in, then outlined? That’s right! Long and short stitch first, and then online it all. Easy and quick! Dear Mary, Your monogram advice is so pretty and thank heavens there is a subtle colour-change thread out there. Congratulations on the website look – very clean and easy to read. I am in love with this monogram. I’d never have come up with long and short stitch for a monogram. Thank you so much. I saw the DMC Variations today at JoAnn Fabrics and bought a light green, a mid blue to violet, and your pink to yellow. Thank you for all the inspiration and eye candy! Hi, Lily – Thanks! I updated that – it’s 3824.